Caching by feature class boundary allows you to create tiles only in the places where you need them, avoiding empty or uninteresting areas. For example, if you are caching a country, you might supply a feature class of major urban areas. By doing so, you are requesting that the server only precreate tiles that cover those urban areas. The rest of the areas can be cached on demand when requested by clients. This can save you time and disk space that would be consumed by creating unnecessary tiles in rural areas. When you publish a service or first initialize a cache, set the Area of interest to cache parameter on the Caching > Advanced Settings tab of the Service Editor. From the drop-down list, choose Import from a feature class. This area of interest only applies if you have chosen to build the cache automatically when publishing. Open the Manage Map Server Cache Tiles tool and set the Area Of Interest parameter. This setting overrides any area of interest that you may have set in the Service Editor. If you're running the Manage Map Server Cache Tiles tool in ArcMap, you also have the option to sketch an area of interest on the screen. This is helpful for one-time runs of the tool where you are trying to patch missing tiles in a known area of the cache or ensure coverage in a given area. However, for most structured caching jobs or updates, it's recommended that you supply a feature class. 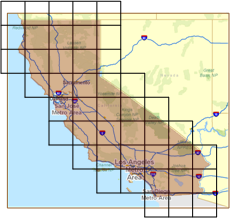 The image below shows a theoretical grid of tiles that would be created if the feature class contained just the state of California. The feature class helps you avoid creating unneeded tiles in the ocean and in neighboring states. These unneeded tiles would have been included if the default rectangular extent were used. You must use a polygon feature class to define your area of interest. If you want to build or update a cache based on a point or polyline feature class, you must first buffer the features by a small amount to get a polygon feature class. It's also recommended you dissolve and generalize the buffers before using them as your area of interest. Since points contain only one vertex, they can often be drawn quickly through a dynamic map service or client-side graphics (like a feature layer in the Esri web mapping APIs). After testing performance, you may find that you do not need to cache your points at all. At small scales, you create relatively few tiles, so it doesn't make much difference whether you cache by feature class or not. Creating all tiles at small and medium scales ensures that as users open your map and begin zooming in, they don't miss any tiles or have to create any tiles on demand.